← Shaming the Pets — Does It Work? 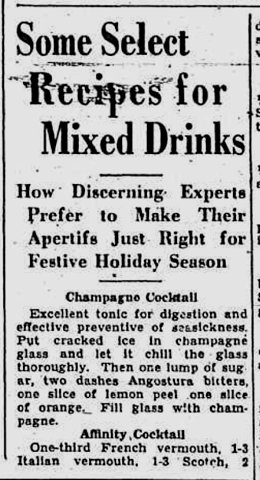 Dec. 20, 1934: In case you doubted me (but you wouldn’t, would you? ), here’s a recipe for the Bronx Cocktail, from the Amsterdam Evening Recorder, courtesy of FultonHistory.com. In case you plan to mix one up, a Bronx Cocktail is one part Italian vermouth, three parts brandy and a dash of orange bitters. Shake well! Notice that there are also three variations of the Manhattan. This entry was posted in 1934, Food and Drink, Suicide and tagged 1934, food and drink. Bookmark the permalink. Hmm. 2:1 is a dry Martini? My preference is 3:1, per the Pullman Parlor Car Commissary Manual of the same era. Earl: I guess the Bronx Cocktail was the origin of the Bronx cheer, no?